In order to implement its mandate as defined by the UN Security Council resolution 1701 (2006), UNIFIL carries out a range of operations across its Area of Operations between the Litani river in the north and the Blue Line (Line of Withdrawal of the Israel Defense Forces) in the south. These include day and night-time patrols, establishment of observation points, monitoring of the Blue Line, and carrying out clearance of unexploded ordnances and cluster munitions. The Line of Withdrawal – also called the “Blue Line” – was identified in 2000 by the United Nations in cooperation with Lebanese and Israeli officials for the purpose of confirming the withdrawal of Israel Defence Forces (IDF) troops from Lebanese territory in conformity with Security Council resolution 425. The Blue Line is not the border between Lebanon and Israel. Importantly, UNIFIL operates in support of the Lebanese Armed Forces (LAF) that has the primary responsibility of ensuring security in the area. Following the 2006 war, the Government of Lebanon decided to deploy 15,000 LAF troops in south Lebanon, including in UNIFIL’s area of operations. At the same time, the UN Security Council authorized an increase in the force strength of UNIFIL to a maximum of 15,000 troops. Besides having responsibility for monitoring the cessation of hostilities, UNIFIL was mandated to, among other things, accompany and support LAF as they deployed throughout the south of Lebanon. This historic deployment of LAF, operating in south Lebanon for the first time in three decades, was quickly achieved with the support of UNIFIL. Immediately upon the deployment of LAF troops in the south, which took place in parallel with the withdrawal of the Israel Defense Forces and the expansion of UNIFIL, LAF and UNIFIL established mechanisms to coordinate closely their operational activities, such as patrols and checkpoints, in the UNIFIL area of operations. The Security Council took note of the results achieved when it stated in resolution 1773(2007) that the deployment of UNIFIL and LAF in the area between the Litani river and the Blue Line “helped to establish a new strategic environment in southern Lebanon” and called for even greater cooperation of UNIFIL with the LAF in the discharge of its mandate. Since the beginning of 2008, UNIFIL and LAF have further intensified their cooperation and moved beyond coordinating their operational activities to carrying out activities together on a daily basis. These activities include various types of day- and night-time patrols throughout the UNIFIL area of operations and along the Blue Line, conducting checkpoints, as well as operations to recover and destroy weapons, munitions and infrastructure left from previous conflicts. UNIFIL and LAF conduct regular reviews of their cooperation to assess results and identify areas where cooperation can be enhanced. Apart from their daily operational activities to implement their respective mandates, UNIFIL and LAF also conduct joint military exercises, training activities and exchange experiences through a joint lecture programme. Training activities and exercises are jointly planned. Joint exercises between the two Forces take place at Battalion, Sector and Headquarters levels. These include joint artillery firing exercises, search and rescue, mass casualty exercises and others aimed at contingency preparedness. Such military exercises are complemented by a lecture exchange programme between LAF and UNIFIL officers that covers topics ranging from purely military ones (such as on LAF structure, doctrine and procedure, mine risk awareness, force protection measures) to more social and political issues (such as on social characteristics of Lebanon). This helps strengthen the conceptual basis for operational cooperation, enables exchange of professional experience and facilitates better understanding of the local environment. UNIFIL and LAF participate jointly in workshops and seminars on issues including Conflict Management and Intercultural Awareness, Mass Casualties and various types of contingency planning, including for natural disasters. A LAF officer also attends the regular Induction Training for new UNIFIL civilian and military personnel and delivers a presentation on the work of LAF. In carrying out its mandate, UNIFIL is assisted by around 50 military observers from some 20 troop contributing countries as part of the Observer Group Lebanon (OGL). An unarmed UN military observer mission present in Lebanon since 1949, OGL is part of the United Nations Truce Supervision Organization (UNTSO). The military observers conduct patrols in villages and along the Blue Line, as a confidence building measure for the area, working in close relation with the local population. Cluster munitions and other unexploded ordnances have killed 27 and injured 234 civilians in South Lebanon. Accidents during demining have caused another 14 deaths and 41 injuries of demining personnel. As a result of clearance and mine risk education activities the number of civilian victims has dropped sharply since the conflict and has been in the range of 0 to 2 per month since the spring of 2008. UNIFIL's Chinese deminer at work in south Lebanon. UNIFIL explosives ordnance experts and de-miners facilitate the mobility of UNIFIL assets by clearing all unexploded ordnances and mines that may affect the movement and the security of UNIFIL personnel. In addition, they are involved in humanitarian demining activities in support of the UN Mine Action Service (UNMAS). 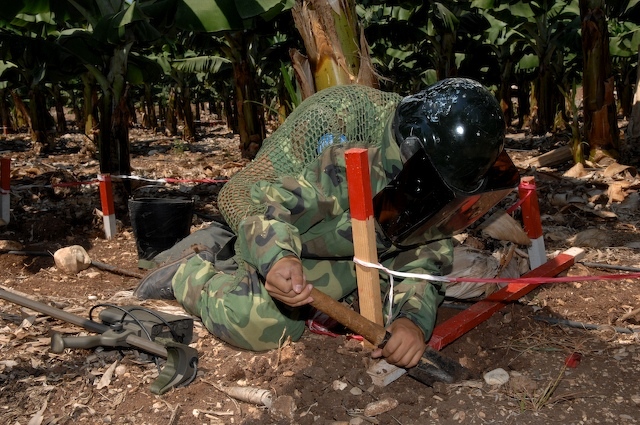 Combat engineers and Explosive Ordnance Disposal (EOD) teams are used to clear areas that were contaminated by cluster-munitions in south Lebanon and other unexploded ordnances like aircraft bombs, rockets and missiles. Cleared land is handed over to the owners. UNIFIL’s eight demining/EOD expert teams hail from Cambodia, China, France and Italy. Since the 2006 war, UNIFIL demining teams have contributed to clearing 4.8 square kilometres of affected land and destroying more than 34,000 unexploded ordnances and mines in southern Lebanon. However, an estimated 425,000 landmines continue to pose threat to Lebanon’s communities and more than 18 square kilometres of land remain contaminated by cluster bombs.. Immediately after the cessation of hostilities came into effect on 14 August 2006 in accordance with the UN Security Council resolution 1701, the UNIFIL Force Commander of the time met with senior representatives of the Lebanese Armed Forces and the Israel Defense Forces. The meeting was held inside the UNIFIL position at the Ras Naqoura Blue Line crossing to discuss the implementation of, and compliance with, the agreement on cessation of hostilities. Also discussed were the withdrawal of the Israeli army and the deployment of LAF in south Lebanon. Over the course of the following weeks, the Tripartite forum met frequently to coordinate the process of the withdrawal of IDF and subsequent deployment of LAF. Following the completion of IDF’s withdrawal from south Lebanon – with the exception of the part of the village of Ghajar north of the Blue Line and a small adjacent area – the meetings continue to take place on a regular basis on the dates agreed to by both sides. They serve as an essential confidence-building mechanism between the parties aimed at enhancing liaison and coordination as well as addressing key security and military operational issues. Topics of discussion, among others, are issues relevant to the implementation of resolution 1701, violations of the Blue Line and the findings of UNIFIL investigations into incidents. The Tripartite mechanism negotiated Liaison and Coordination Arrangements between UNIFIL, IDF and LAF, which were agreed in April 2007 and in which the parties committed themselves to providing information on positions and deployment, closer liaison ties, and the establishment of a hotline between the Force Commander and the designated Generals of LAF and IDF. The parties have also engaged in and are committed to implementing a pilot project for visibly marking the Blue Line on the ground, whose aim is to reduce the number of inadvertent violations and to build confidence between the parties. UNIFIL carries out the project jointly with LAF and the IDF.